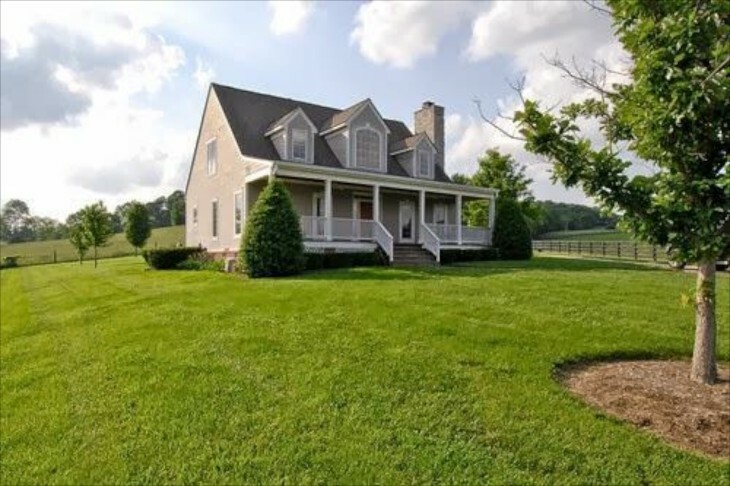 You are here: Home / Decor / Sheryl Crow’s Solar Horse Farm! Country music star Sheryl Crow has had her challenges for sure, but she seems to flow through them with a balance that is so often lacking in many celebrities. 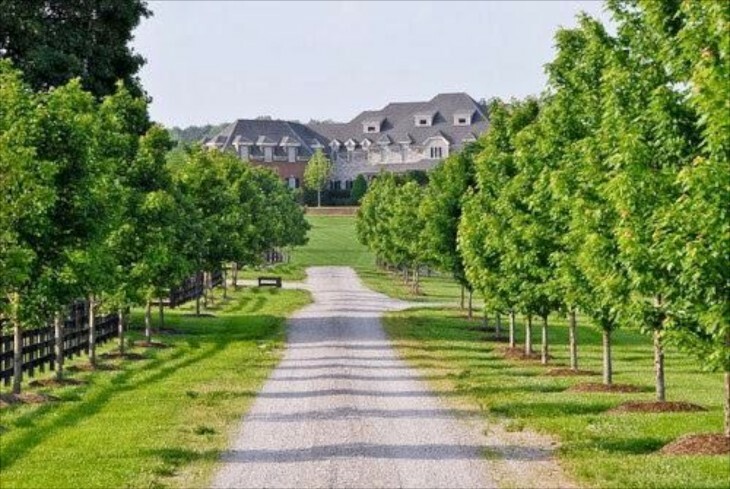 She purchased this152 acre farm, known as Cross Creek Farm, in 2006, and which is located just outside of Nashville in order to be close to her family, although she also maintains her Los Angeles, California home. 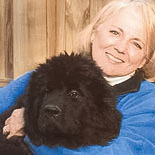 When she purchased the home she invested in solar systems not just for the home, but for the many other outbuildings that required electricity. The system is designed to reduce electrical costs by 42%. 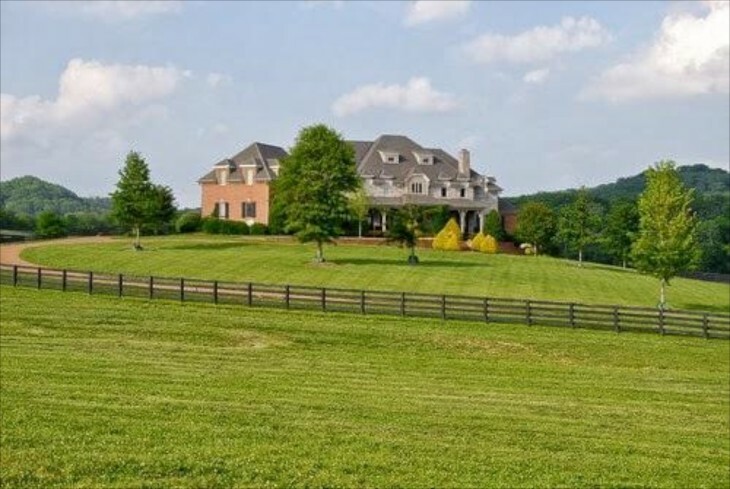 In 2010 she listed it for sale for $7.5 million. It didn’t sell, so she took it off the market. 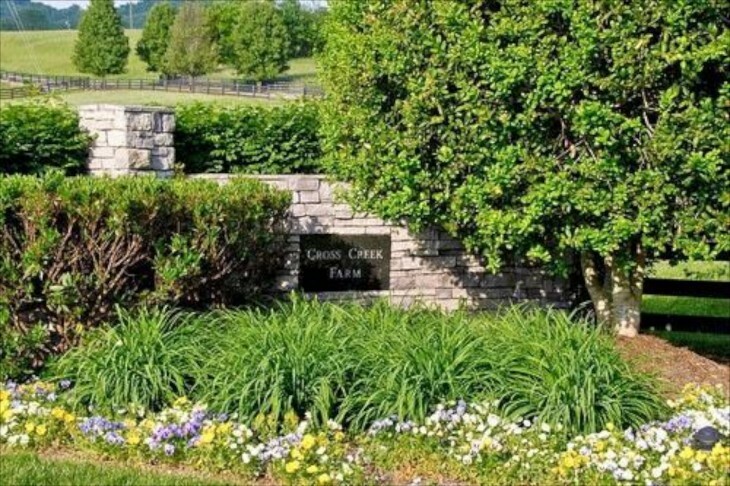 In early 2012 she put it back on for $5.8 million before reducing the acreage to 51, and the price to $3.85. Let’s take a look and see what you would get. Stone, shrubs and flowers provide a lovely landscaped approach to the farm. Love, love the trees that line the long drive, but I especially like the gravel drive. A much more rewarding sound! 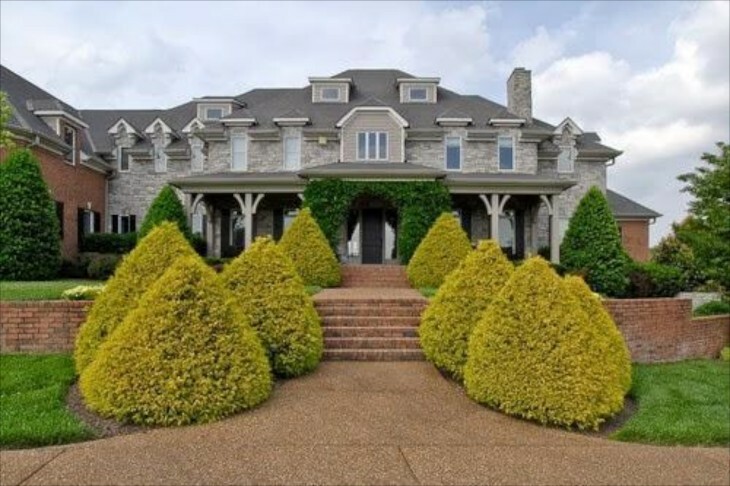 The main home features brick and stone and a huge front porch. The house is 10,433 sq. ft. It takes a bit of effort to arrive at the front door, but it looks so welcoming. The combination of dormer types is quite interesting. The large front porch can easily accommodate a large overflow crowd, or family that wants to enjoy southern breezes and the views. 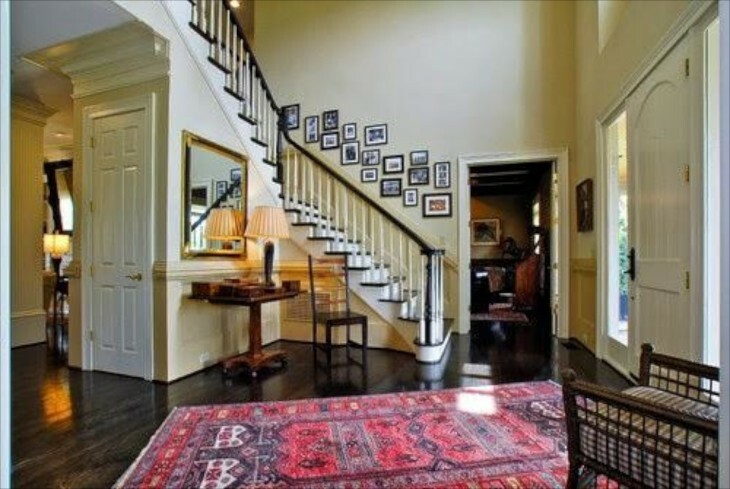 The foyer soars to the upper levels, and appears fairly simple. I would add some architectural trim details on the photo wall going up the stairs. 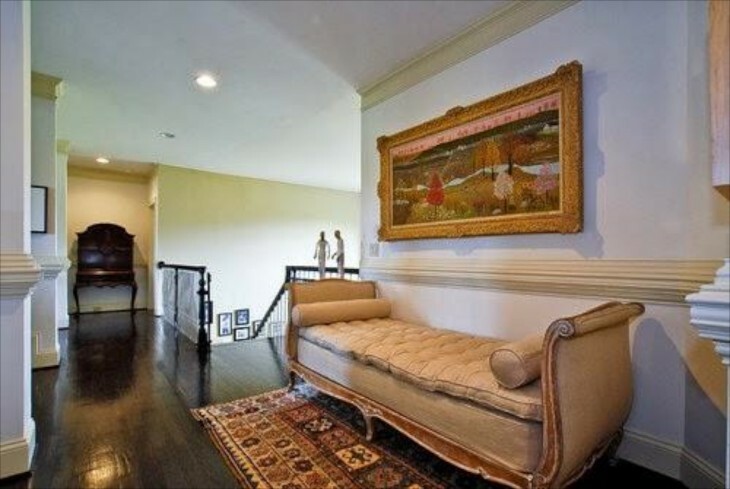 This living area is directly off the foyer to the right. As you view all the photos you can see that this home was meant for comfort and the enjoyment of her two young sons Wyatt and Levi. 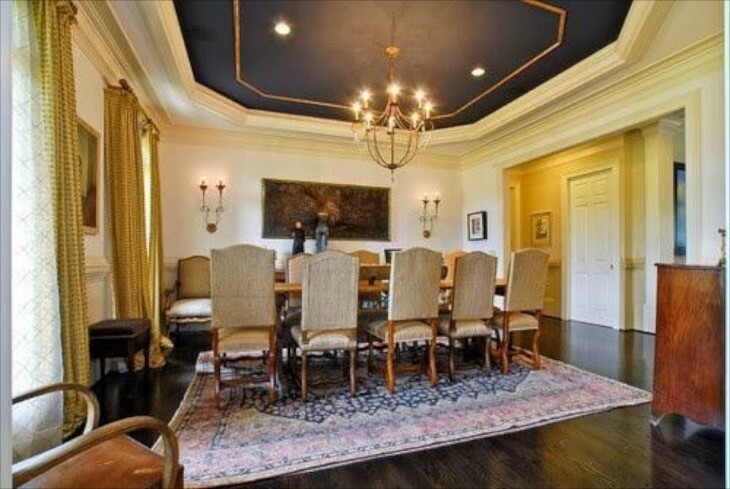 The formal dining room. 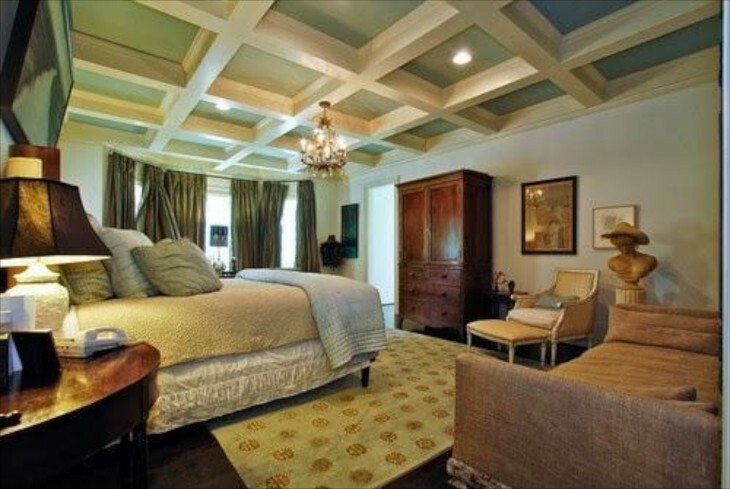 Although I like painted, and often darker ceilings, this might work better if the ceiling had been tray. I probably would have done a bit more with the ceiling, or the chandelier. I like it, but the scale is a bit off, at least from this photo. From this view, I would definitely have used a larger lighting fixture, maybe a rectangular one, or a second one of what is there. Yup….that would work. The columns add a lot of interest, but also help to create the feeling that walls can give, by defining the space and making the room more inviting. Very pretty. In this room the bookcases/display shelves are square boxes, which I like. 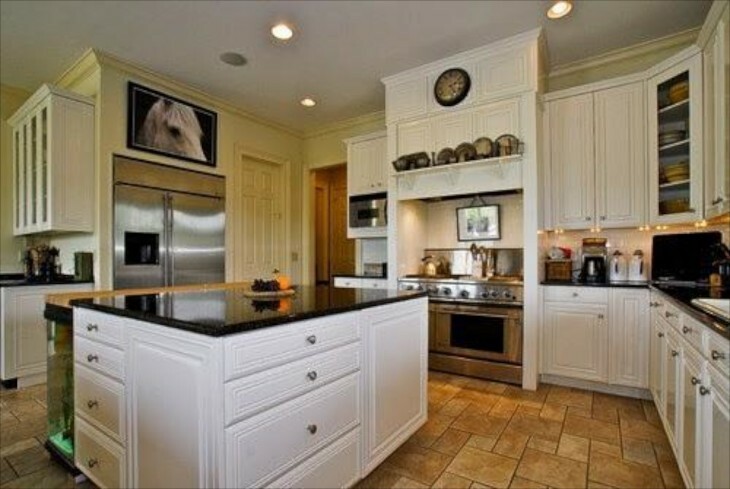 The kitchen is all white with black grate and stainless appliances. Bright for sure. 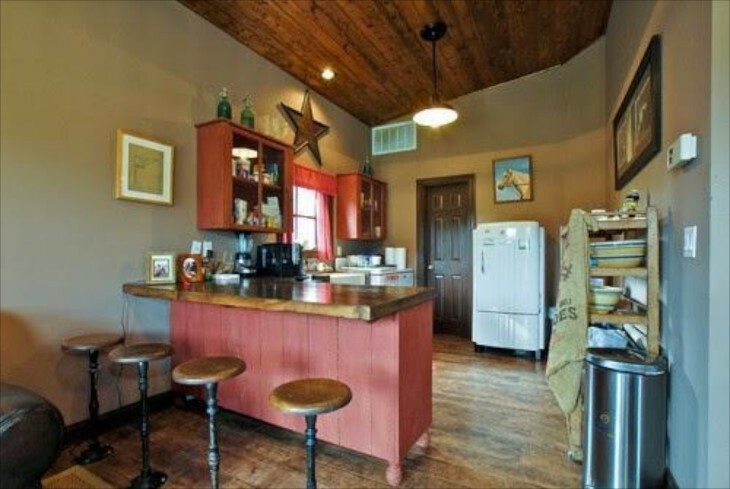 I am not a fan of the stove framed in like that…….you need counter space for pots pan, ingredients, etc., without having to duck around corners. I am willing to bet that any serious cook using this kitchen has uttered a few “words” regarding the lack of counter to the left and right. To the left of the refrigerator you can see a coffee/drink area. 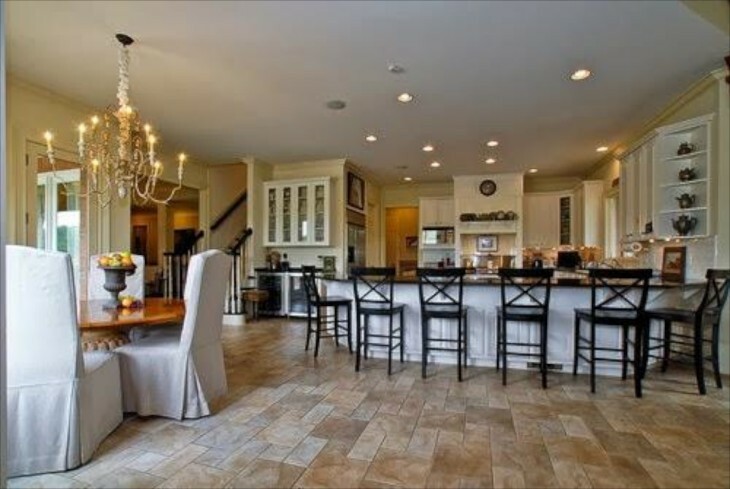 Here is a view of that drink area and the rest of the kitchen, which is quite open and conducive to entertaining a lot of people easily. Notice the back staircase. 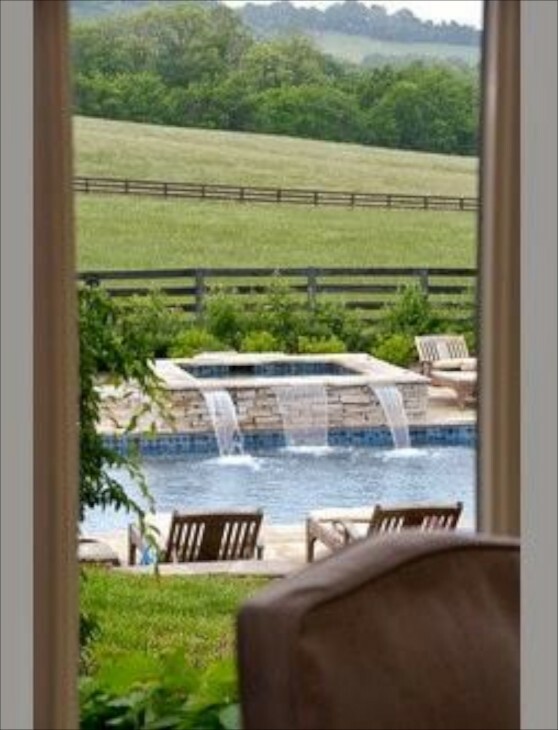 A partial view from the kitchen eating area to the pool area and pastures beyond. The keeping room adjoining the kitchen. 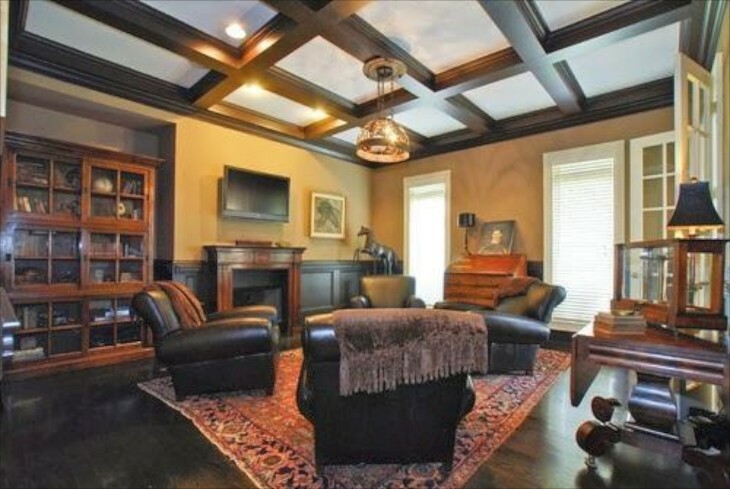 The timber trusses are beautiful, especially with the stone fireplace. A more direct view. Like the black cabinets to each side of the fireplace much better than if they were white like the kitchen cabinets. 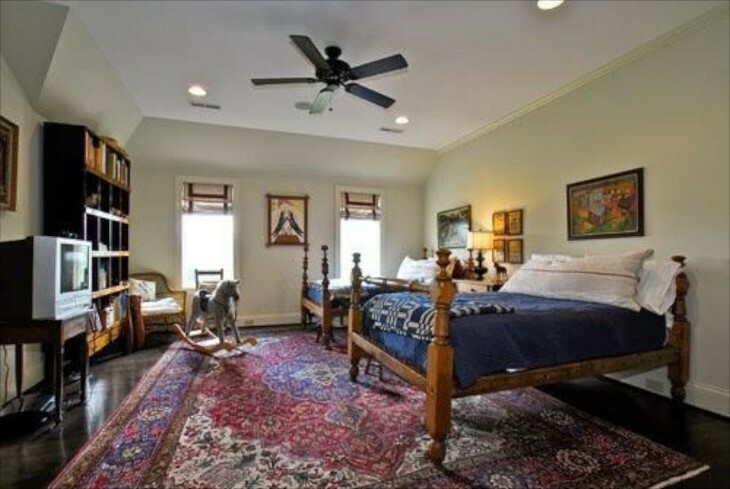 One of the six bedrooms. you can tell that a lot of thought was given to comfort. Lovely rooms, refined yet not pretentious at all. The same bedroom, opposite wall. 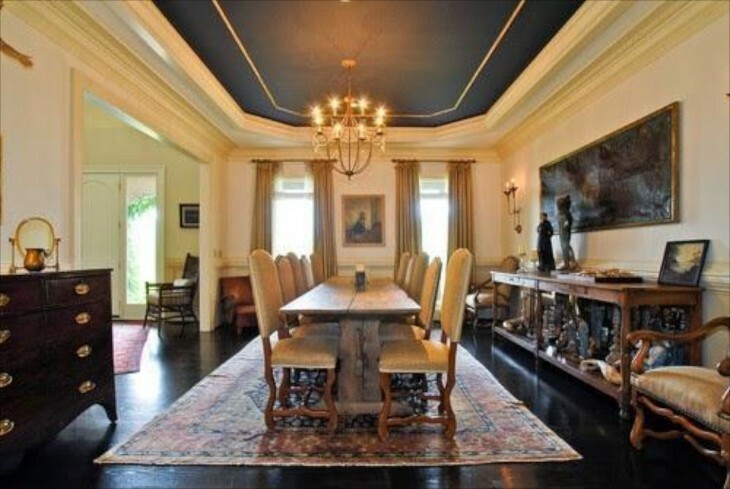 I like the coffered ceiling with blue paint. One of the home’s eight baths. I adore the huge clock on the far wall!!! I also am a huge fan of large wall in showers. Plenty of storage. Again, the blue from the bedroom ceiling continues in the bathroom. The dark stained floors are throughout the home. Another of the bedrooms with space enough that a table and chairs easily fit. 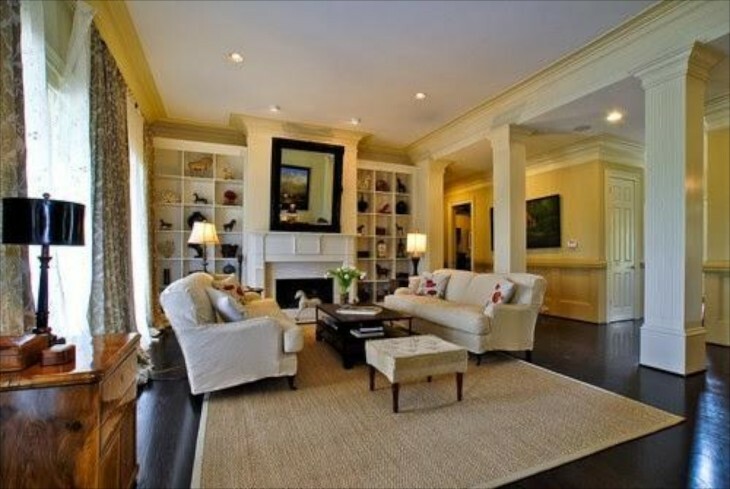 The room is spacious, and bright, however, it needs heavier crown moldings. 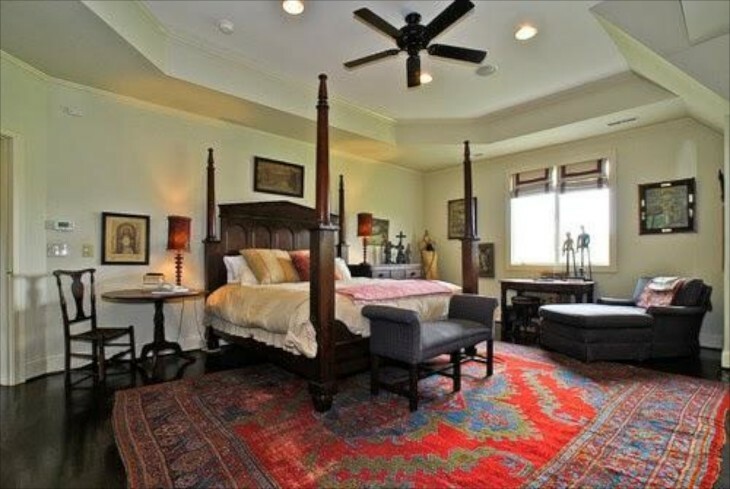 This looks like it is one of her son’s bedrooms. Great boys room. Look at the old TV on the small table. And the old fashioned rocking horse. What an amazing and interesting bed. 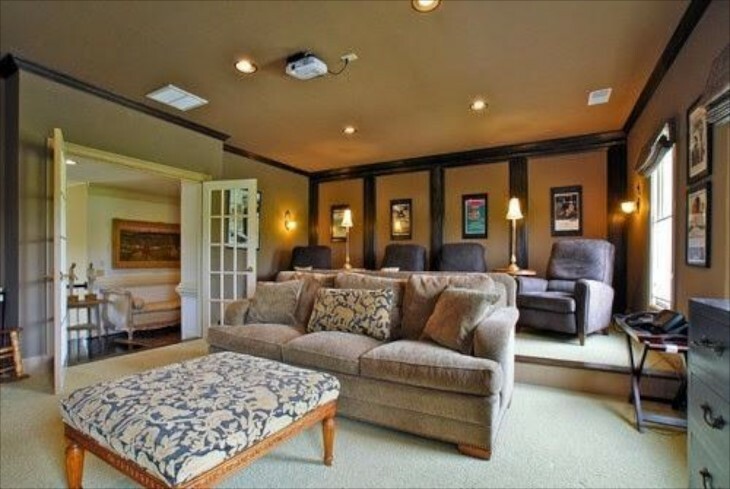 Upstairs theater room with a popcorn machine in the corner. Yum! 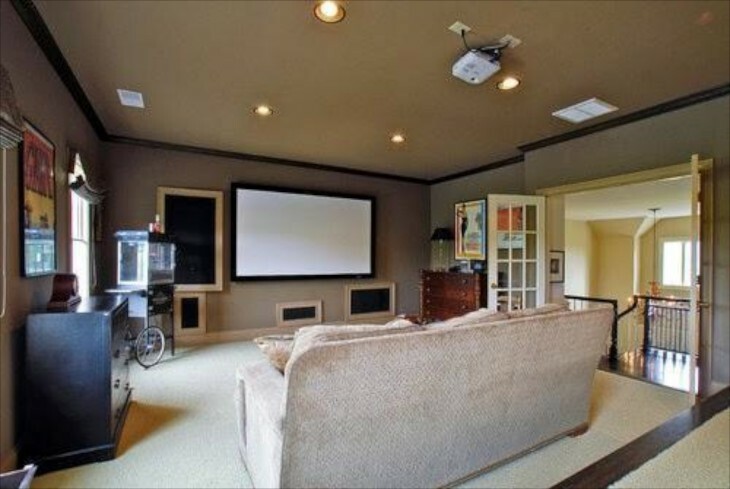 Another view of the theater room. 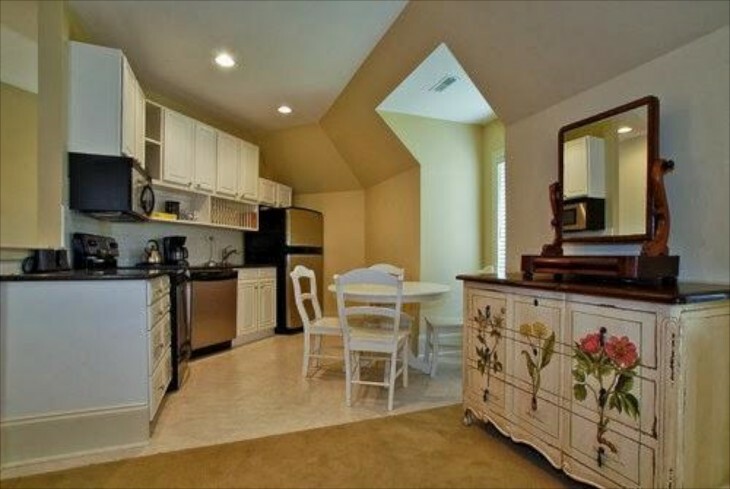 Upstairs mini kitchen as well. 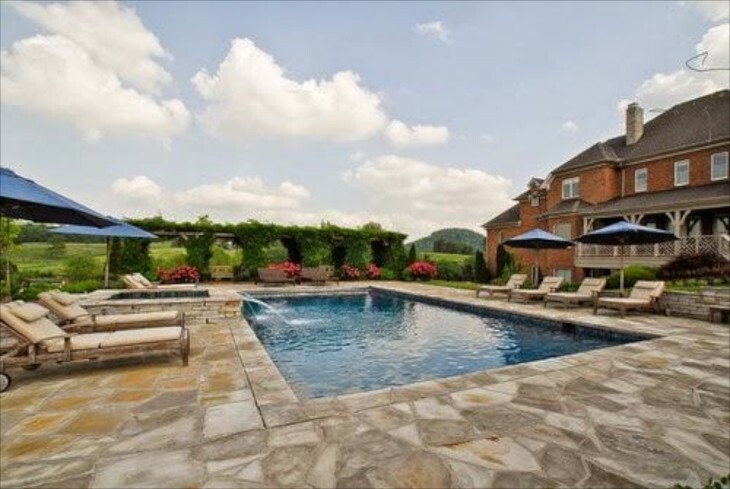 View of the back of the home and pool area. Nice covered back porch, and a pergola to the right. 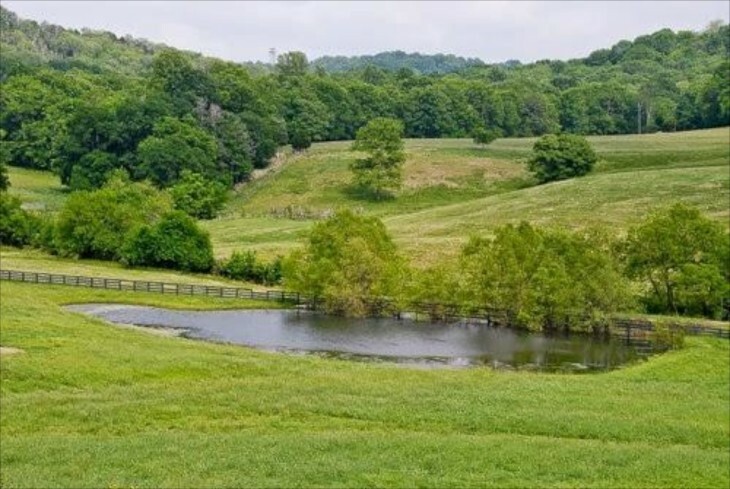 View from the back porch to the pastures beyond. Pergola is to the left. This photo must have been taken later, because the vines have almost covered it. A nice shady respite from the southern summer sun and heat. The guest house….a sweet and inviting cottage. There is also a garage, utility building behind and to the right, unfortunately out of view in this photo. What little boy and his dog wouldn’t enjoy fishing and cooling off in this pond? The barn is Sheryl’s favorite place to spend time. 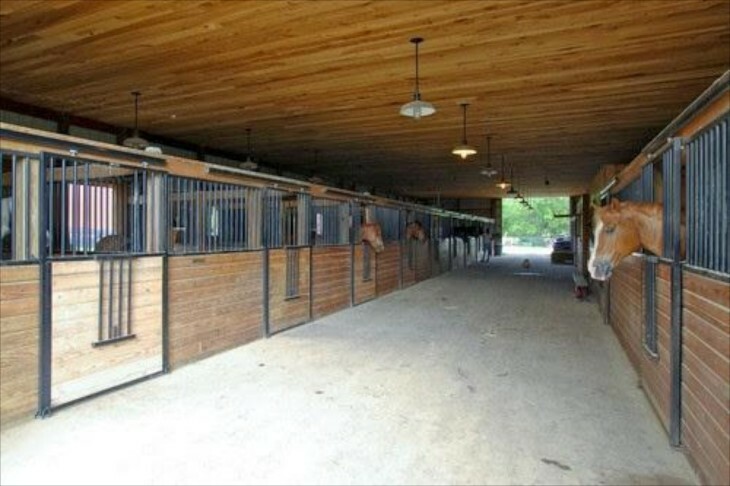 Shr has had as many as sixteen horses on the property. Almost seems a little “Texas” like. 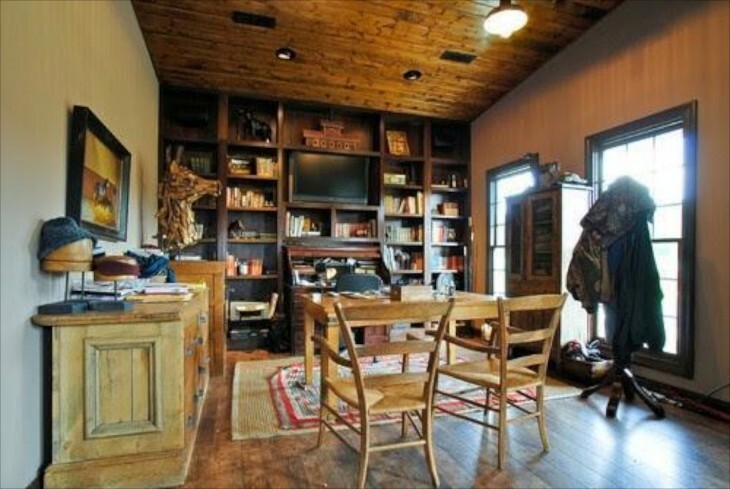 I love the saloon doors that lead to the room shown below. Don’t you love the row of old school or church seats along the wall? 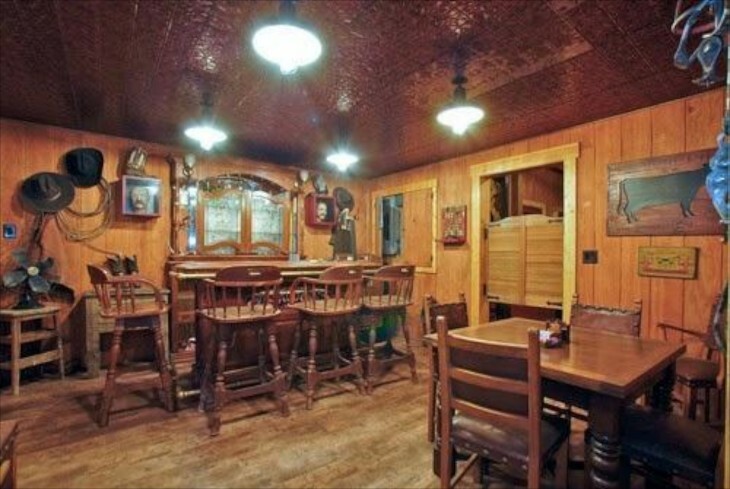 The saloon room. 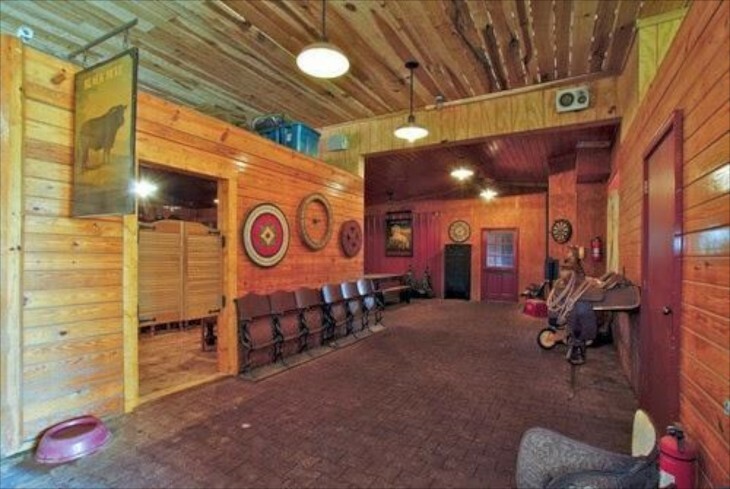 What a fun place for Sheryl and friends to sit and play music and for her boys to play and pretend they are cowboys. Notice the tim ceiling. 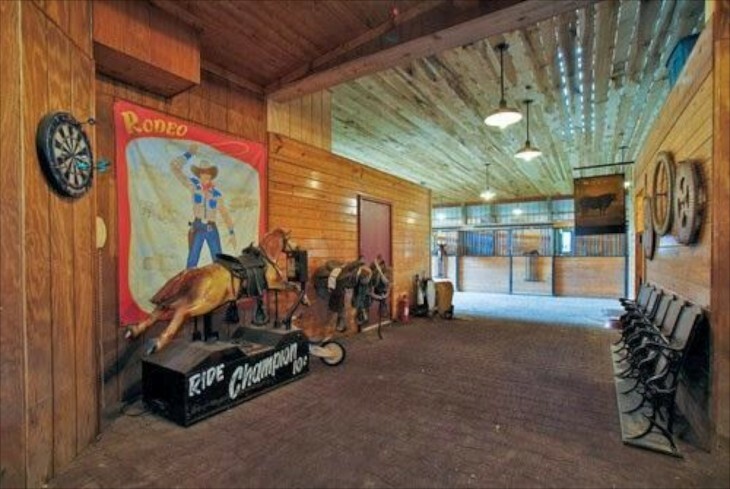 Across from the school auditorium or church seats, what little boy or girl wouldn’t love to have that horse to ride. She definitely had children in mind. 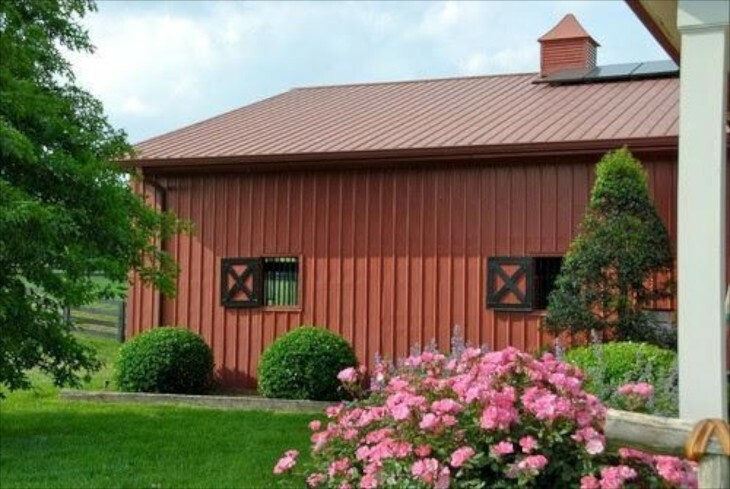 Outside view of the barn area. I like that she chose red. I hope you enjoyed this. As large a home as it is, the rooms were decorated nicely. 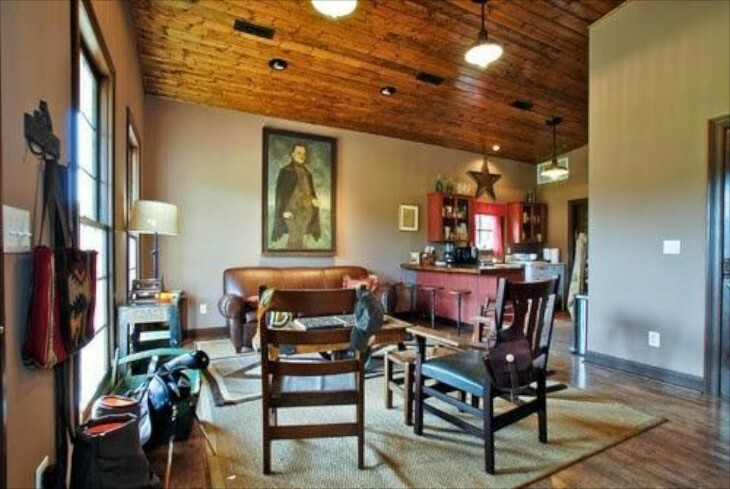 A guest would feel comfortable and welcomed, as would any family. 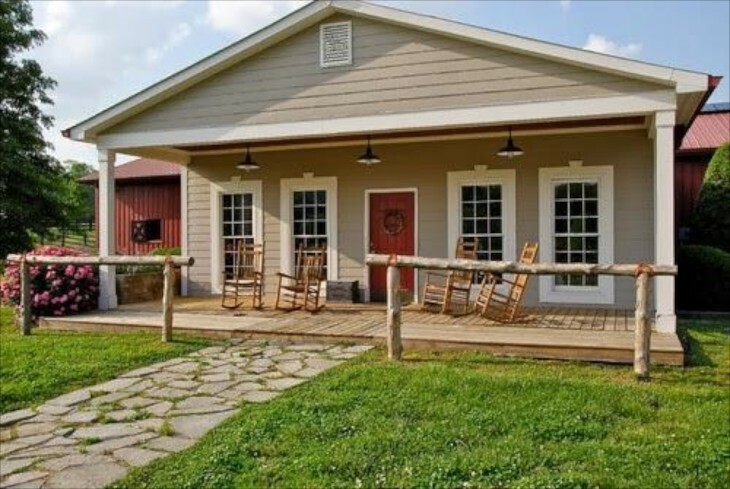 I could live very happily in the barn! !